Odysseus is indirectly mentioned through the term odyssey that the author uses to describe Švejk's legendary trip from the garrison prison at Hradčany to field chaplain Katz in Karlín. Odysseus is a characters from Greek mythology, best known through Homer's epic tales, the Odyssey and the Iliad. [1.10.1] Znovu počíná jeho odyssea pod čestným průvodem dvou vojáků s bajonety, kteří ho měli dopravit k polnímu kurátovi. Toník was one of the two soldiers who escorted Švejk to Katz. It appears from the dialogue that he is a Czech patriot and regards Švejk likewise. Toník is mosly referred to as Čahoun, a nickname for a long and lanky person. Toník is short for Antonín. 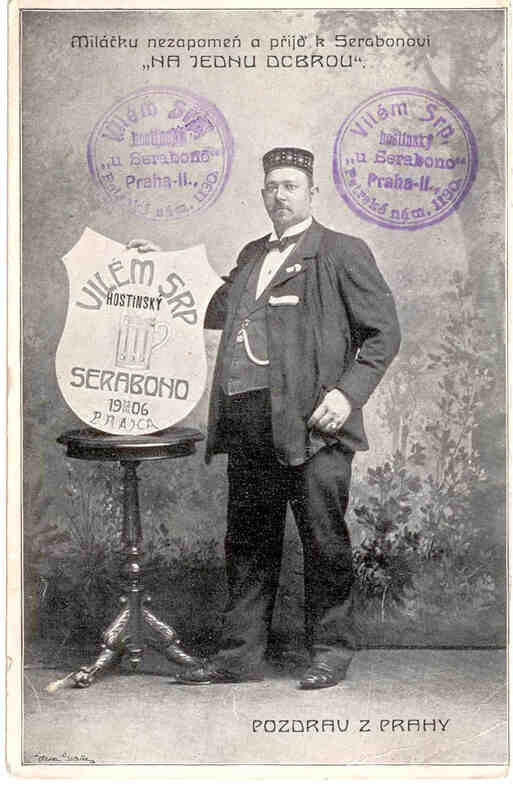 Serabona was according to Švejk landlord at Na Kuklíku, member of Sokol and therefore to be trusted. Serabona is a name which origin is unclear but the connection to the mentioned pub is obvious. Landlord at Na Kuklíku from 1901 was Vilém Srp, and there is even a picture of him on a postcard from 1906. Here the pub is called U Serabono and the address confirms that it is the same place as Kuklík. It is possible that Serabono was a former owner; pubs were often named after the original owners. It may hypothetically even be a nickname of Vilém Srp, or the name could have an entirely different origin. Vilém Srp (sometimes written Srb) was born 15 April 1864 in Panenské Březany east of Prague. In 1897 he married Marie Nováková with whom he already had the daughter Božena. From 1901 and until 1928, when the building that housed Na Kuklíku was demolished, he owned and managed the named hostelry. In 1916 it appears that the pub closed for a period, and in 1918 the name U Miláčka appeared in an advert, just as on the mentioned post card. Srp lived in the building next to the restaurant and he died on 26 May 1931. So far it has not been possible to confirm the author's assertion that "Serabona" was a member of Sokol. [1.10.1] „Pojďme na ,Kuklík’,“ vybízel Švejk, „kvéry si dáte do kuchyně, hostinský Serabona je Sokol, toho se nemusíte bát. Mařka was a prostitute who frequented Na Kuklíku and who went to U Valšů with a soldier. The name is a short variation of Marie. Franta was a wounded soldier who had taken part in the campaign in Serbia. He was drinking at Kuklík when Švejk and his entourage dropped by. Franta is short for František. Drašner was a police commissioner who once before the war had raided Na Kuklíku looking for prostitutes just when Švejk dropped by. He is also mentioned in a song. See Mařena. Later he appears in the story about Mestek. Drašner was a policeman at IV. department by Policejní ředitelství in Prague. He was employed in the police force at least from 1902 and records shows that he held the mentioned position in 1913. Čech informs that he had been promoted already in 1911. By 1918 he had been promoted to head commissioner. He continued to serve in the 4th department also in Czechoslovakia. The photo from Milan Hodík confirms that he was alive as late as 1937. This is confirmed by newspaper articles from January 1939 that also indicate that he had recently retired. Newspapers reveal that he was very active in controlling prostitution in Prague and he also investigated cases of human trafficking. He was a well known figure amongst the prostitutes and was in general held in high esteem by them although some also feared him. Drašner was married to Cecilie (b. 1880), and in 1905 their first child was born. The girl however died already in 1909. In 1913 no further children are registered in the police protocols. [1.10.1] Švejk vžil se ve vzpomínky, když tu často sedával do vojny. Jak sem chodil policejní komisař Drašner na policejní prohlídku a prostitutky jak se ho bály a skládaly na něho písničky s obsahem opačným. Mařena was a lady of ill repute who frequented Na Kuklíku before the war and is mentioned in the song about Drašner. The name is short for Marie. She should not be confused with Mařena from [I.6]. Epicurus is referred to when the author maintains that small and fat people have the same philosophical attitude as Epicurus: get as much pleasure as possible, the less pain the better. 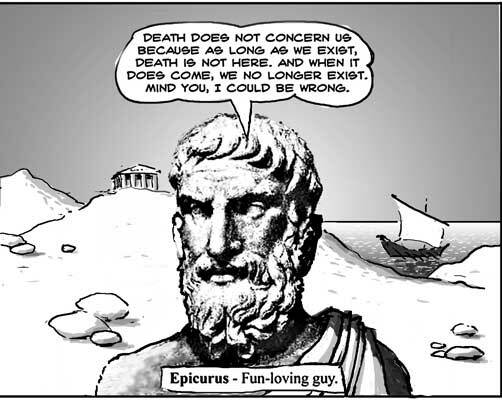 Epicurus was a Greek philosopher who maintained that the connection between good and evil is equvalent to the physical sensation of pleasure and pain. A well-known quote: "Do not fear death because when you exist death does not and when death does you do not". This laid the foundation of the Epicurian philisophical school: obtain maximum pleasure when you still can. [1.10.1] První z nich, který našel zde úplného uspokojení, byl malý tlustý, neboť tací lidé, kromě svého optimismu, mají velký sklon být epikurejci. Feldhuber was a senior lieutenant from whom Katz had borrowed a previous servant. The latter was a teetotaller and this did not suit Katz at all. No officer carrying this surname can be identified from the address books of Prague (1906, 1910, 1913). Nor was there any Feldhuber in the police domicile records during the period so this must have been a rare surname. Nor does it appear in the Verlustlisten (loss lists) from the war. [1.10.1] „Dobře, podívejte se tady na toho vojáka. Toho jsem si vypůjčil na dnešek od obrlajtnanta Feldhubra, je to jeho pucflek. A ten nic nepije, je ab-ab-abstinent, a proto půjde s marškou. Po-poněvadž takového člověka nemohu potřebovat. To není pucflek, to je kráva. Ta pije taky jenom vodu a bučí jako vůl. Helmich was a senior lieutenant to which party Katz went. The field chaplain was in the end thrown out and got picked up by Švejk. Their trip back from Helmich is an in-depth study of drunken drivel. A certain senior lieutenant Alfred Helmich (born 1872, Vienna) actually served in Prague in 1906 and 1910, in the Feldhaubitzerregiment that were garrisoned at Hradčany. Whether or not the author knew or knew about this person is only guesswork, but can't be ruled out. In the address book from 1912 he is not listed with this unit. If this is the person who inspired the character in the novel, it is logical that Katz needed a cab back to Karlín. Helmich lived at Hradčany (1906) and Malá Strana (1910). [1.10.2] Již třetí den byl Švejk sluhou polního kuráta Otto Katze a ta dobu viděl ho jen jednou. Třetího dne přišel vojenský sluha od nadporučíka Helmicha, aby si Švejk přišel pro polního kuráta. Just was an officer in Infanterieregiment Nr. 75 who Katz got Švejk mixed up with, being inebriated on the way back from obrlajtnant Helmich. This is a person that has so far never been linked to any real-life model. Moreover Infanterieregiment Nr. 75 was not stationed in Prague in 1914, they had been moved away from the city already in 1909. For K.u.k. Heer the Schematismus for 1914 show up a number of officers carrying the name Just. None of them held ranks as high as colonels, and none of them served in Infanterieregiment Nr. 75. Batěk is mentioned when Katz, with a heavy hangover sounds like a lecture by dr. Batěk. Batěk was a Czech doctor of chemistry and very prominent in the fight against the twin demons of alcohol and tobacco. He was also a vegetarian, sci-fi writer, scout-activist, YMCA-activist and pacifist. For a long period in 1919 he held (almost) daily lectures at Staroměstské náměstí so it is probably these the novel refers to. More than 100 of the lectures were printed in a collection of installments published by Nakladatelství Kočí in 1919. His Sto jisker ethických (One hundred sparks of ethics) is included in the collection but the timing indicates that Katz could hardly could known about them at the time so here the author has mixed in contemporary elements and moved them back into history by six years. Batěk also published the mentioned lecture as a separate 16-page pamphlet. He was very productive; the catalogue of the Czech national library lists more than 500 items under his name. The other pamphlet mentioned, "Let's declare a life and death struggle against the demon of alcohol ...", is not listed in the catalogue. He also lectured for the Czechoslovak abstinent's association, together with Moudrá a.o. [1.10.3] Polní kurát byl stižen dokonalou kočkou a naprostou depresí. V tom okamžiku, kdo by ho slyšel, musil by být přesvědčen, že chodí na přednášky dra Alexandra Baťka „Vypovězme válku na život a na smrt démonu alkoholu, jenž nám vraždí muže nejlepší“ a že čte jeho „Sto jisker ethických“. Šnábl was a captain at the Bruska barracks who according to Katz had good ořechovka (nut spirits). The field chaplain also sent Švejk there to borrow one hundred crowns. The captain was a monster according to Švejk. The good soldier had to kneel in front of him and the matter was only resolved when he told the captain that money was needed for child support. This character has no prototype as far as we know. Bruska was used by IR28 but the address books from 1906 and 1913 list no officer with this name neither here nor at other barracks in Prague. There were many people with the surname Šnábl or Schnabel in Praha at the time, but the address book from 1907 has none of them listed as belonging to the army. Jaroslav Hašek has surely known or known about people with this surname and could in his usual manner have borrowed it. Curiously one Hynek Schnabl lived at Na Bojišti 1732/14 in 1907, and U kalicha was actually located in the same house! Mahler an officer at Vršovice kasárna. He was one of the three officers to whom Švejk was sent to by Katz to borrow money. No trace of any Mahler can be found in IR73 or the 8. Traindivision, the largest military units that were garrisoned in Vršovice. In fact there was not a single Mahler registered in any of the Prague garrisons in 1907. Presumably the name of this rather peripheral figure was picked fairly at random. Fišer was a captain at Hradčany. He was one of the three to whom Švejk was sent by Katz to borrow money. It is unlikely that this peripheral figure has any real-life model. At Hradčany there were several barracks, amongst them artillery and Landwehr, but in 1906 no officer with this name was listed in the address book. [1.10.3] Nezdaří-li se to tam, půjdete na Hradčany k hejtmanovi Fišerovi. Tomu řeknete, že musím platit futráž pro koně, kterou jsem propil. Kejřová was the cousin of Müllerová and was present in Švejk's flat when he visited his home for the last time. She had received a letter from Müllerová who was now locked up in the Steinhof concentration camp. The arrest had taken place the very evening she had pushed Švejk to the military in a wheel-chair. The letter is quoted in the novel, complete but words removed by the sensors. The letter reveals that Mrs. Müllerová believes that Švejk already has fallen in battle or been executed. This could be a name the author borrowed from an advert in Národní politika on 28 March 1915. If this is the case, she was owner of a cookery school, author of cook-books and teacher of cookery from Hradec Králové. It is not inconceivable that the author already knew about her. On the other hand: according to police records there were 313 carriers of the name Kejř/Kejřová in Prague at the time so who (if any) Hašek used as a prototype is debatable. What we do know is that the author made use of several fragments from newspapers published late March/early April 1915, so this could be another example. See Liman. Narozena 1874 v Kralupech nad Vltavou, zemřela 16 September 1926 v Praze. Učitelka vaření, autorka kuchařských knih. Napsala: Cukrovinky na vánoční stromek, Dělnická kuchařka se sřetelem na malé dělnické domácnosti, Dělnická kuchařka, Kniha vzorné domácnosti, Minutové večeře, příležitostné hostiny, Úsporná kuchařka, Úsporná válečná kuchařka, Zdravotní polovegetariánská kuchařka, Zlatá kuchařka s rozpočty, Návod k přípravě pečiva s použitím výrobků "Kveta", Česká vegetariánská kuchařka Anuše Kejřové,České moučníky Anuše Kejřové, Naše ryby a jich vhodná úprava, ... - Zdroj Česká národní bibliografie. [1.10.4] „To je náramně žertovné,“ řekl Švejk, „to se mně báječně líbí. Tak aby věděli, paní Kejřová, mají ouplnou pravdu, že jsem se dostal ven. Ale to jsem musel zabít patnáct vachmistrů a feldweblů. Ale neříkají to nikomu...“.